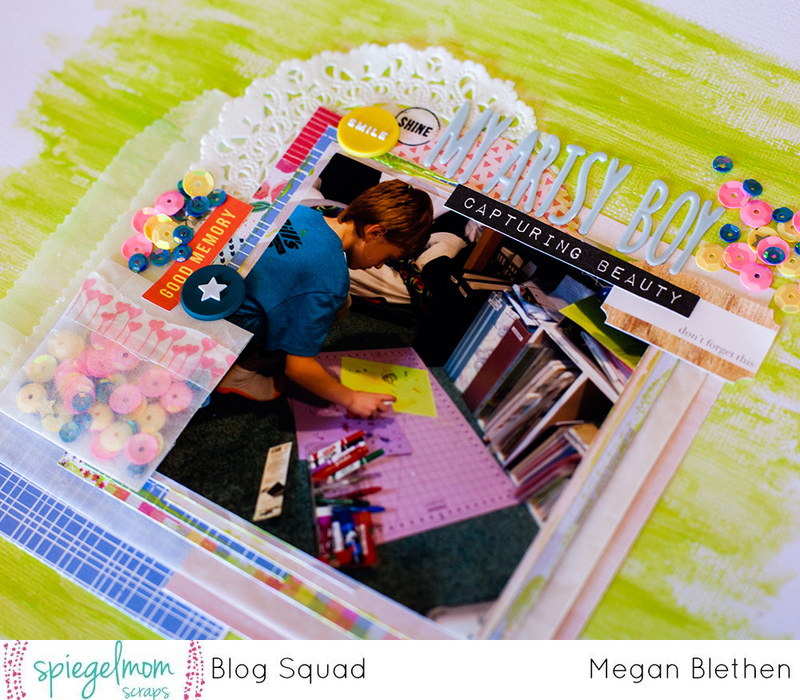 Hello everyone and welcome to the SpiegelMom Scraps Sparklers Unit blog hop! The Sparklers are split into two teams; The Blog Squad and the YouTube Squad. Each month we come together to hang out here and bring you some great tips, technique and inspiration! For this hop, you should have arrived here from Beth’s amazing blog. I absolutely LOVE her layout!! Those butterflies with the sequin pockets are amazing!! 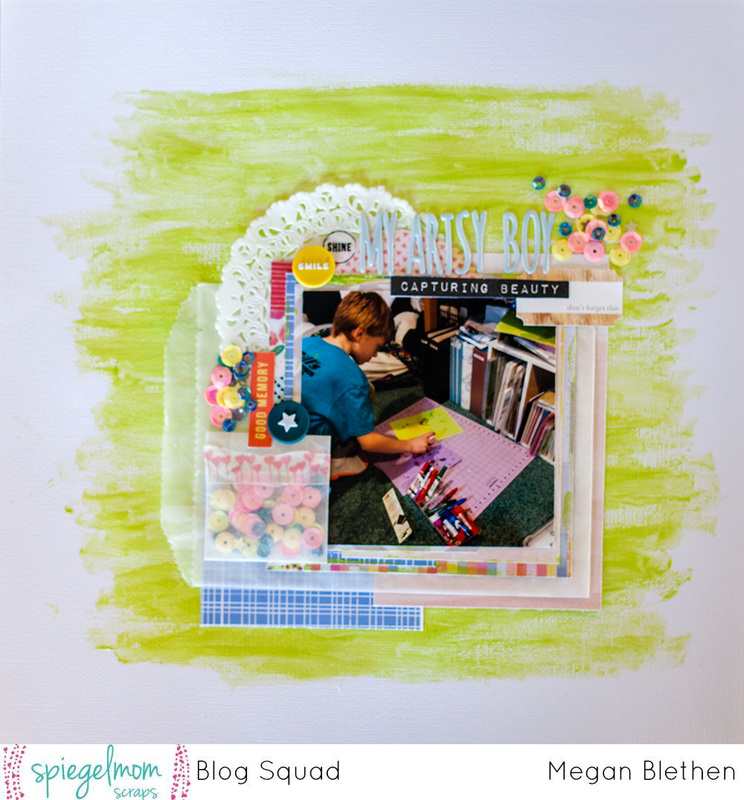 Now let’s jump in to my layout that I made to share with you today! I’m excited for you to see it. I have been putting off this assignment all month because I wanted to make THE perfect layout to show off Jody’s amazing products. The month of July just flew right by and before I new it the weekend had come and I still hadn’t made my layout AND I was going out of town. UH OH!! So, I packed up my May, June and July Citrus Twist kits, which have been my go to paper and embellishment products for the past few months and I put my SMS kit that Jody had sent me in with it and I left town. I was a little nervous about scrapping away from home, especially since it was such a last minute decision, but I really loved doing it! 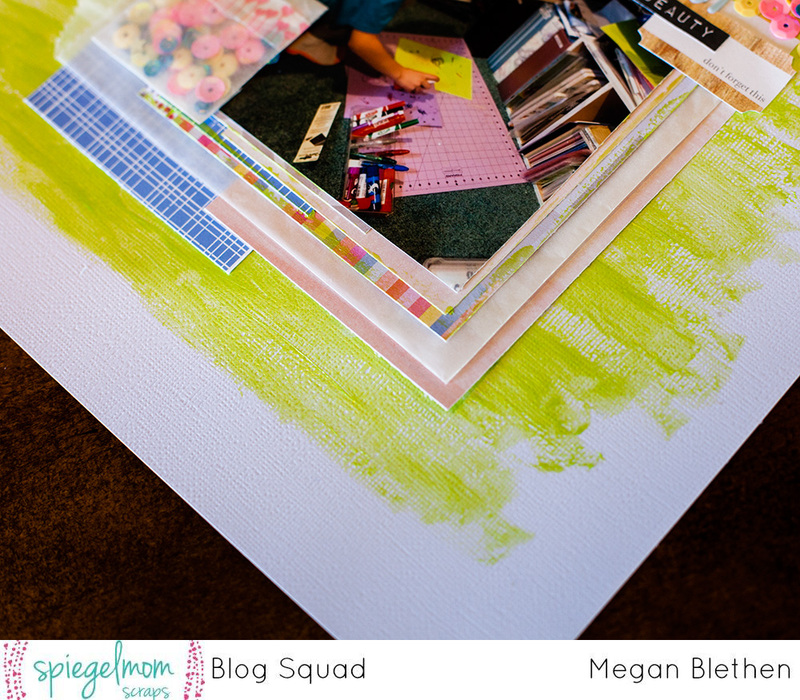 It put me out of my element and really challenged me to scrapbook in a different way than I normally do. I decided to use the Sour Apple Shimmerz Dazzlers on the background. I only had my Close to my Heart medium round brush with me so it was a little tricky painting the background, but I really LOVE how it turned out!! It took a while to dry, but it was well worth the wait!! 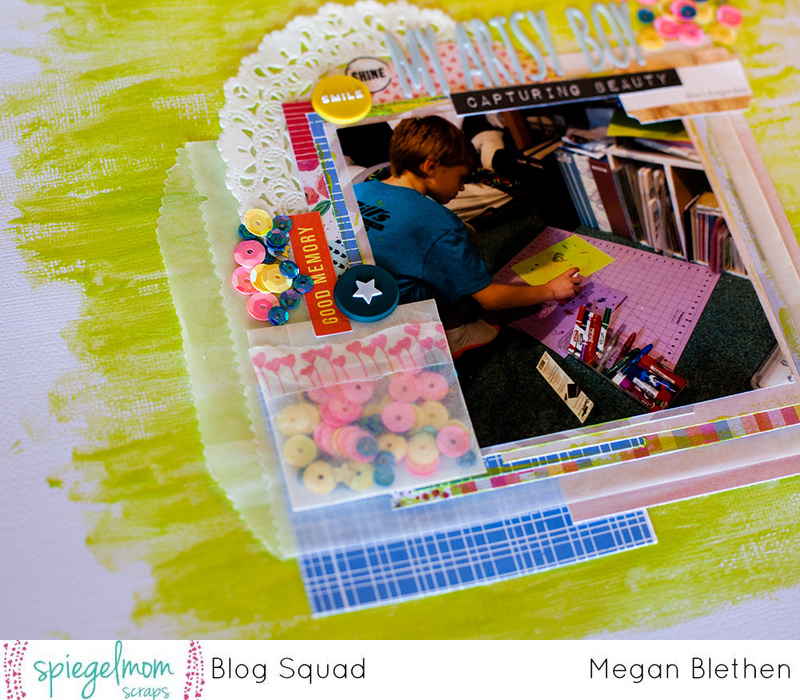 I wanted to use the Hot Right Now sequin mix because it is just so pretty and the colors were perfect for this layout! Some of my fellow design team members have been making layouts with piles of sequins and I have really loved the look of them. I decided I wanted to do something similar on this layout and decided to go with just a random scattering of a sequin pile. I really LOVE how it all worked out in the end. I piled them together and then I was so afraid to pick them up to glue them onto the layout, but it actually worked. I have been wanting to use the little glassine bags to make a sequin pocket for a layout since I got my kit!! I was so excited to work that into my layout. I actually had to pull the bag apart because it wasn’t quite as small as I wanted it to be and it covered too much of the photo and the other glassine bag opening. I taped it back together with my Tombow Mono Permanent adhesive. I am thinking I might do my journaling on a big piece of paper and stick it into the large glassine bag that’s behind the whole photo mat. I knew when I saw this photo that I wanted to make the title ‘My Artsy Boy’ with the Fancy Pants Atwell puffy alpha stickers. I really love the light blue color and how it stands out against the pattern paper and the green Shimmerz. Layering is one of the things I have a harder time with, but on this layout it seemed to all just flow and came out great! I really love the 2 layers I added under the glassine bag on the bottom. I used some Pink Paislee Fancy Free papers, Pink Fresh Studio and an exclusive Citrus Twist kit paper as well as. The white textured American Crafts paper that I used for the background can be found in Jody’s shop. I haven’t always been a huge textured paper fan, but I really love how it makes the dazzlers paint look on the background. Thank you for spending your time with us today! I’d love for you be in the running for the $10.00 shop credit, so be sure to leave comments on all the blogs to be entered! You have through August 4th to comment and enter. Sharing on social media will also earn you an extra entry. 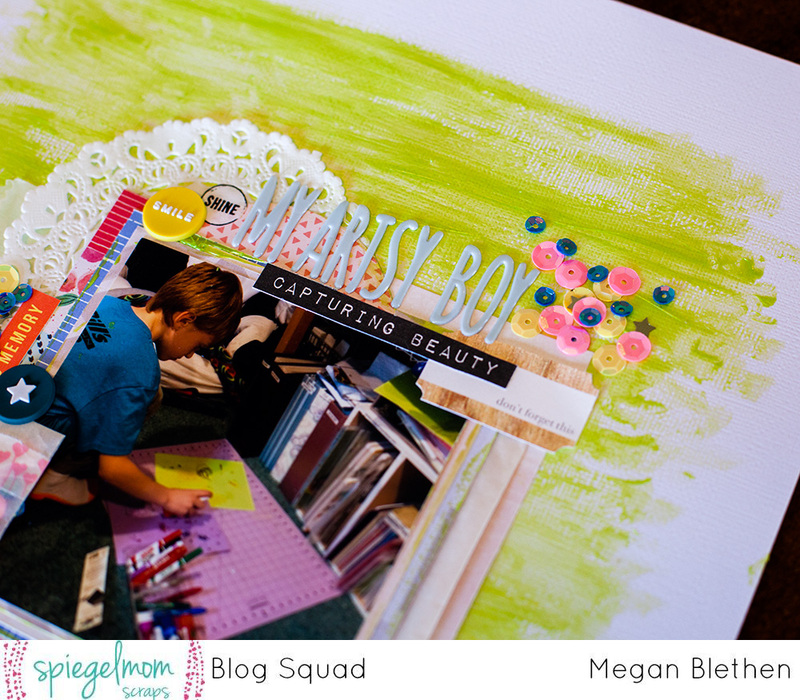 Just leave another comment letting us know where you shared the blog hop event. Now, you’ll be heading over to Sara’s blog. Enjoy the rest of the hop!! Isn’t it so amazing?! I love it! Great layout, I like how you used the glassine bag as a sequin pocket. Megan- this is wonderful! Love the “piles” of sequins and the shaker glassine bag! So cute! This turned out so great! I really love the sequins you used as it really brings your eye to the photo! Love the pop of color on the background. Really great color combo! The sequins pop against the green background. Thanks Tina! I really like the colors too! Thanks Tina! I love how they pop against the background too! This is so pretty Megan!! I’m not sure what my favorite part is… that piles of sequins or the background or the little glassine bag with sequins… AH I can’t pick!!! It’s all beautiful!! I love all the layers and using the Dazzlers as the background. So pretty! Aren’t they so fun! Thanks Amanda! Fantastic layout! I love that beautiful background! Love the glass one bag!!! I get so many of those, and this is a great re-use idea!